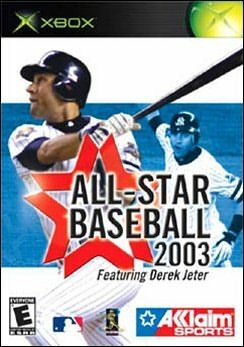 All-Star Baseball 2003 takes the pitch on the XBox Games console and hits a home run with possibly the best ball game to hit the home entertainment system. All improved and not so new, Acclaim are on a winner with this title. Not so popular in Australia yet, baseball is one of the biggest games in the USA and Japan. Fans of the game should be very impressed with this title which has included all players from all teams with an accuracy of up to a few weeks. All your major players have been modelled excellently allowing you to play the role of your favourite star with uncanny accuracy. 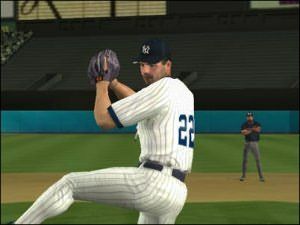 Previous incarnations of this title have been met with a bit of dismay due to poor game AI and a generally sloppy interface that put gamers off the franchise, opting for some of the other baseball titles in the market. This new version however proves that Acclaim has listened to it's critics and incorporates a host of new features and general improvements including. There is still a slight problem with collision detecting in as far as players on bases go and one of the greatest parts of the game: stealing bases doesn't seem to have been worked into the AI's defensive routine. Everything that the baseball connoisseur could desire has been included in this release as it has been fully licensed by the MLBPA and contains all the major league stadiums as well as a few fantasy and classic arenas. In order to create as realistic gameplay as possible, Acclaim has painstakingly captured hundreds of motion captured moves and given them to your players to breathe some life into them. As far as sounds go, All-Star Baseball have all their bases covered (no pun intended) with almost every baseball oriented sound recorded in high quality and excellent coverage by a three man broadcast booth consisting of Thom Brennaman, Steve Lyons, and Bob Brenly. 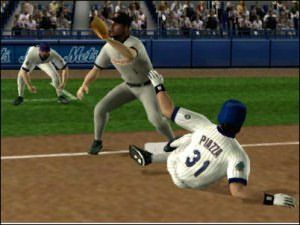 For those of you who love their statistics there is a Deep Franchise mode that has the ability to track stats for up to twenty seasons and provide vital information as to the performance of your team. There is also a hall of fame team that will allow you to make some of the best dream teams that you could imagine and take them to the world series, the holy grail of baseball. 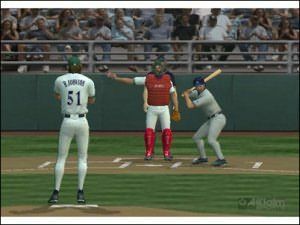 All things said and done, I would have to give All-Star Baseball 2003 a ringing endorsement. There is almost nothing to fault and the small problems that I have mentioned very rarely actually occur. Baseball fans can buy this title with confidence.